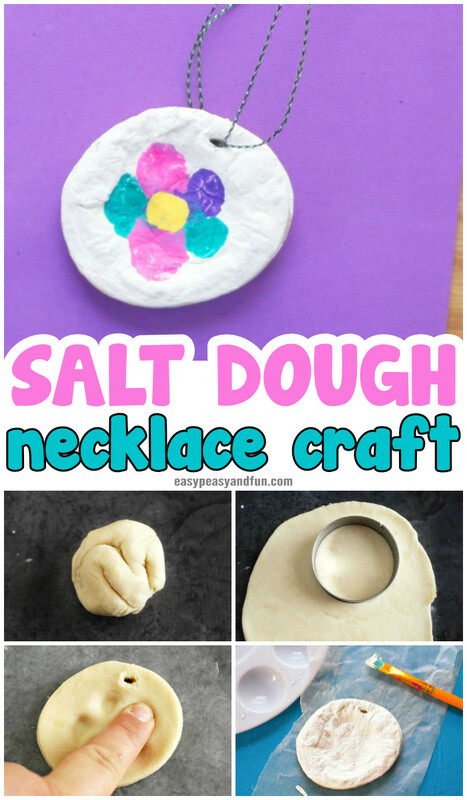 Make beautiful Salt Dough necklace with your kids. 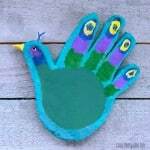 This Mother’s day craft is perfect to make with your kids at home or if you are a teacher, in your classroom. 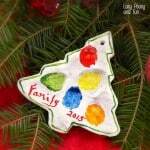 This cute keepsake can be made by toddlers, preschoolers kids in kindergarten and older kids. 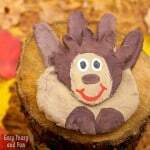 Already planning your Mother’s day crafts for you kids to make? Need something that’s easy to do and won’t cost you a fortune? 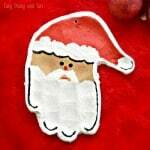 Salt dough is really inexpensive and oh so versatile! Just check these salt dough handprint candle holders. 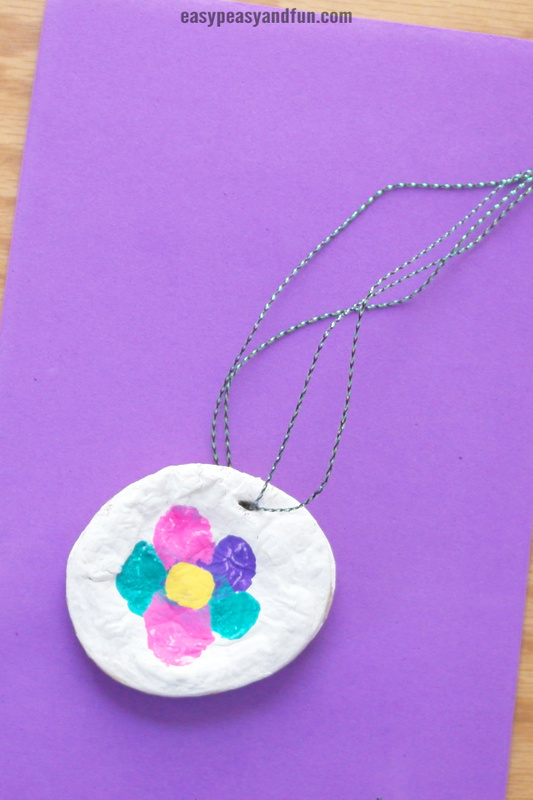 Those are a wonderful kid made gift, as well as this adorable necklace that we are sharing with you today! 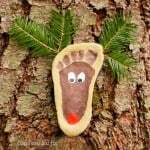 Make salt dough – you can follow use our salt dough recipe. 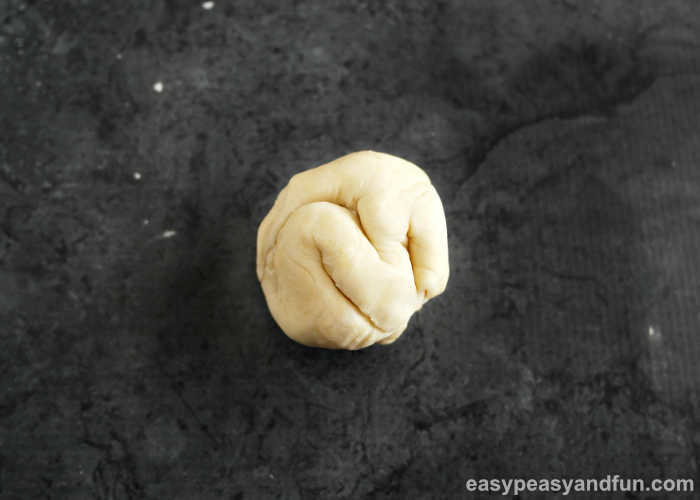 Roll a small portion of salt dough into a ball. Using a rolling pin or cup, roll the dough out until it is about 1/4- 1/2 inch thick. 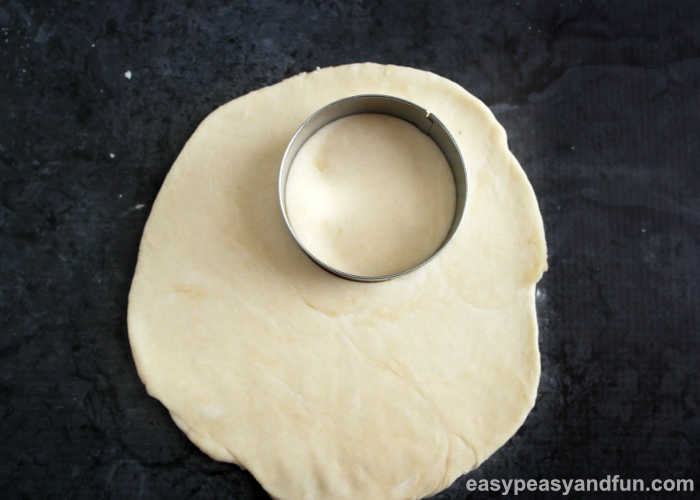 Use a circle cookie cutter to cut circles from the dough. 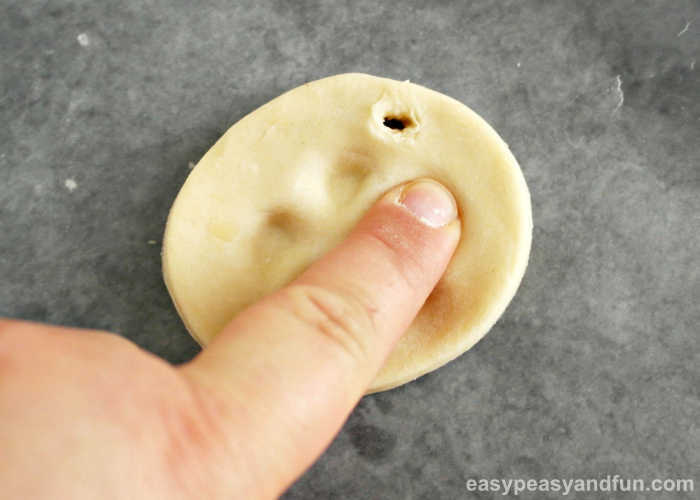 Place the circles on wax paper. Lightly press the tips of your fingers into the dough in a circular pattern, like flower petals. This will leave a slight impression so you know where to place finger prints when painting later. Bake, air dry or use a microwave oven to dry. Microwave on high for 10 seconds, then 20 seconds. Heat for 20 seconds at a time until dough hardens. Let cool completely. 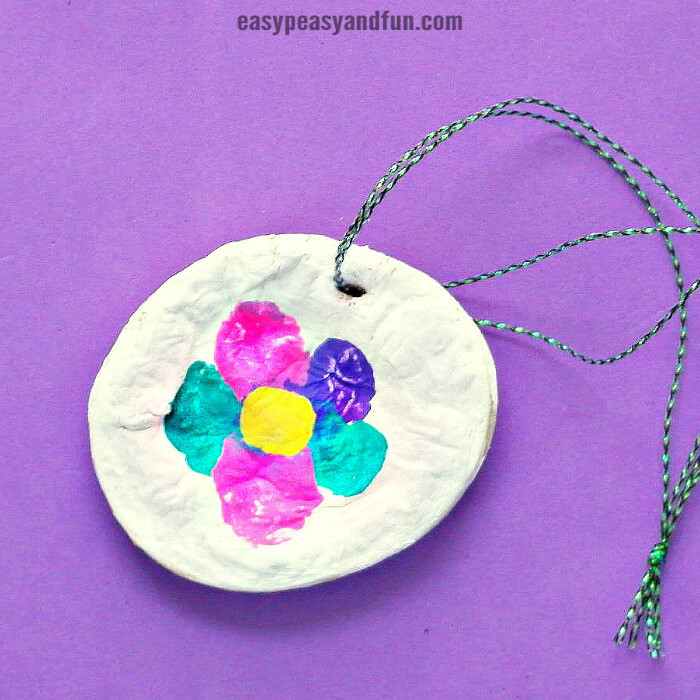 Paint the whole circle white first (this will help the colors stand out). 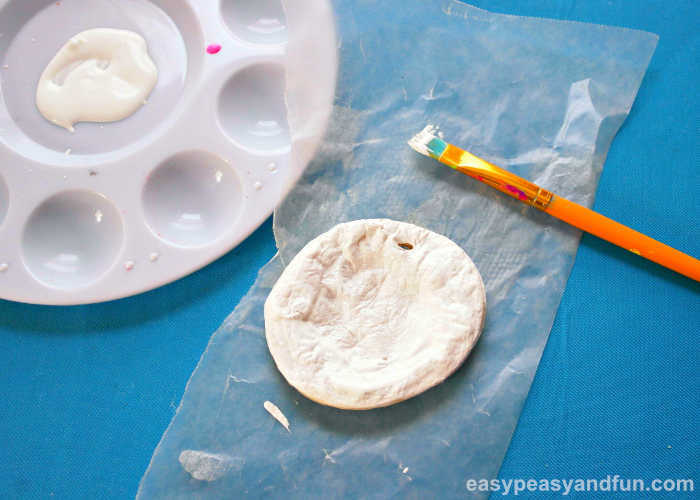 Squeeze a small amount of paint onto a paper plate or palette. 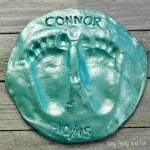 Dip finger tips into the paint and press down on the dough where you made the impressions the first time. Allow to dry , thread a piece of string or twine through to hang. Spray with acrylic to make it shine and last longer!